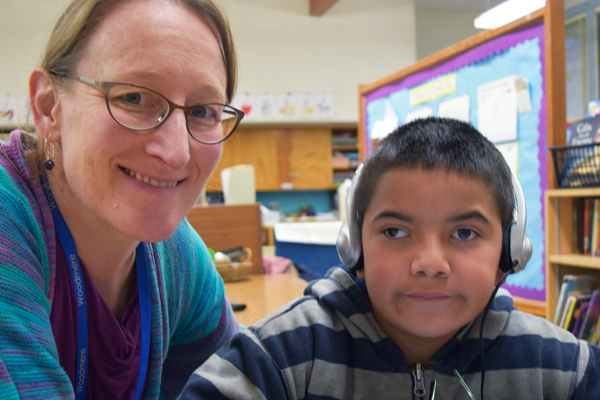 Photo: Special Education Teacher Beth Brod, M.S., uses print and audio books to help struggling readers in her classroom. What do special education teachers appreciate about The Shadow Project? Beth Brod, M.S., likes the program’s goal setting sheets that motivate her K-5 students to achieve academic and personal goals like reading at home, listening, and improving school attendance. Beth has been the special education teacher at Woodmere for the past three years. Prior to Woodmere, Beth taught for a combined nine years at Harrison Park and Clark elementary schools. She received her master of science in special education from Portland State University. She is on The Shadow Project’s Teacher Advisory Board, and she donates generously through the Portland Public Schools Giving Campaign and the Willamette Week Give!Guide.